Breakaway rails can be used to accommodate a variety of odd board shapes (see Figure 1). The other reason to use breakaway rails is to create the necessary clearance from component to board edge (see Figure 1). 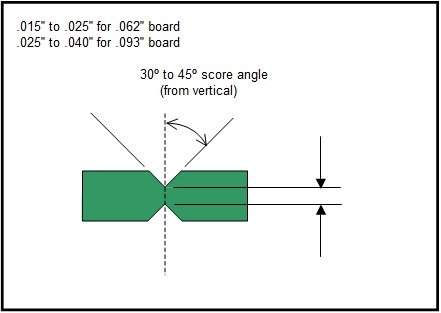 As a general rule, top side components must be clear from the two long sides of the board outline by .120" (3mm) and bottom side components cleared by .200" (5mm). If this condition can’t be met, then the designer must add either 1 or 2 rails as necessary. Breakaways can be accomplished by either using routed slots along with a series of “mouse bites” (see Figure 2) or by a V-grove scoring of the board (see Figure 3). If a breakaway rail is needed along an entirely straight edge.. For all other cases, use slots with mouse bites. Breakaway rails that are added only for increasing component–to-board-edge clearances are to be at least .500". 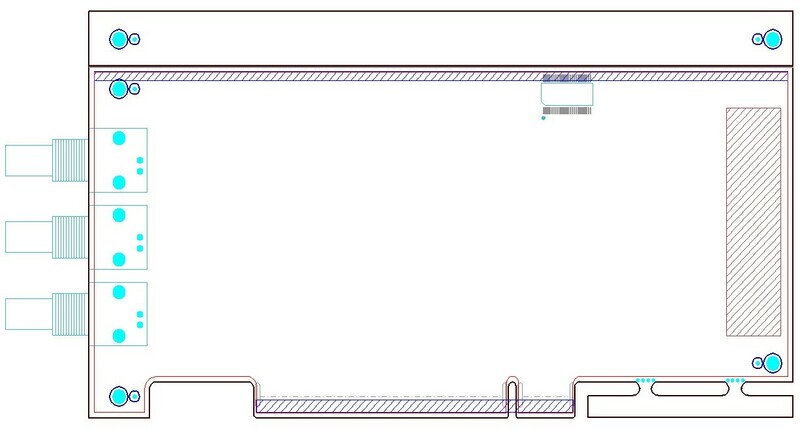 These rails should also include fiducials and a .125" non-plated tooling hole in each corner (see Figure 1). The component at the top edge of the board may violate the component keep-out area shown because the added v-groove breakaway rail allows the board to be fabricated and assembled with proper clearances. Please note that if the board will be part of a sub-panel assembly, rails are not necessary, since the sub-panel will have the rails. Rails take up material and thus add cost.